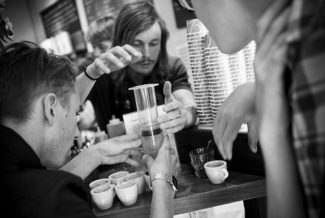 If you are looking for a perfect coffee making experience but for some reason you’re skeptic when it comes to appliances originating from China, you may want to read on and find out about producers from some other countries. The list below features some of the popular coffee makers from the USA, Germany, Italy, and Switzerland. This coffee maker produced in the USA by Aerobie weighs only a pound and it is a perfect coffee provider for all of you who are in a hurry. It doesn’t take more than 30 seconds for Aerobie AeroPress to process coffee, no matter whether you’re in need of Americano or espresso-style shots. It makes up to four cups of coffee at a time and it’s perfectly easy to use. 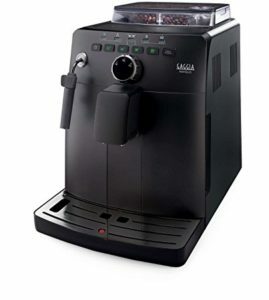 Additionally, this awesome machine comes to you with 350 bonus micro filters that are also produced in the USA and are a great way of providing you with grit-free coffee. 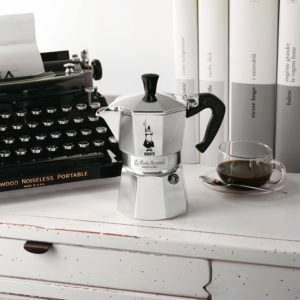 This coffee maker made from high-quality aluminum comes from Bialetti, the widely popular Italian producer of coffee appliances, in the characteristic eight-sided shape. With its 1.5 pounds, it’s a bit heavier than Aerobie AeroPress. On the other hand, it’s easily cleaned and it can produce up to six (2 ounces) cups of coffee. Another coffee maker coming from the USA, Chemex, has the capacity of 30 Oz and a lovely elegant appearance that includes a polished wood collar and a leather tie. 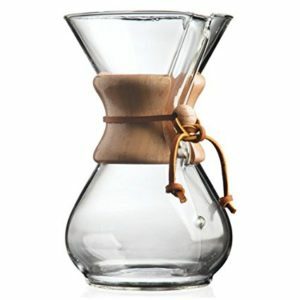 What speaks the best about Chemex, or more precisely, about its design, is the fact it was ranked among the 100 best-designed products of modern times by the Illinois Institute of Technology. If you decide to use this coffee maker, you’re going to need the special Chemex filters. 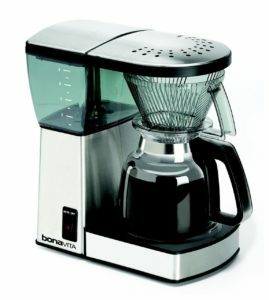 This coffee maker is the product of Bonavita, the leading German company. It is made of top quality stainless steel and designed to make the cleaning process easier while providing you with up to 8 cups of coffee at a time. One of its main features is the separate heater that will keep your coffee fresh and warm for a longer period. This appliance can also brag with the obvious simplicity – starting from the filter basket that allows filling, brewing, and cleaning in no time, all the way to the practical water tank. With its 1400W heater, it provides perfect water temperature and really fast brewing with the optimal extraction. 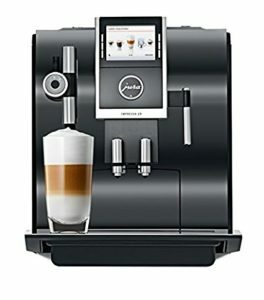 If you are a Moka lover and you want a quality maker machine, KRUPS KM4689 from Germany may be worth your consideration. At the temperature of 187ºF, this coffee maker provides a rich flavor of up to 10 cups of coffee at once. The heating element is made from stainless steel, and the appliance has a glass a glass carafe with safety latch providing the stability of the carafe and it also includes a permanent filter. 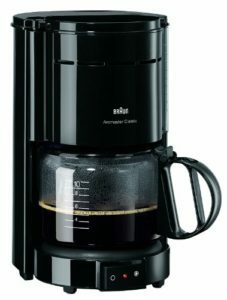 This list wouldn’t be complete without a coffee maker produced by Braun, Germany, so we’re featuring Braun KF47 Aromaster Coffee Maker, weighing only 2.2 pounds and coming in a size suitable for households of any size. It can provide you with ten cups of coffee at a time and offers a flavor protection system. Other great features of Braun KF47 Aromaster are its anti-drip, pause and serve filter, as well as cord storage. Switzerland is another country competing in the category of quality coffee makers. The Swiss coffee maker that has captured our attention is Impressa Z9 made by Jura. It is famous for the fine foam technology and Aroma plus grinder that keeps the coffee aroma at the highest level, while at the same time being two times faster than the regular grinders. The best possible conditions are provided by the use of two separate thermoblocks – one of them for steam, and another one for coffee and hot water. The simplicity of the usage of Impressa 79 is provided by TFT color display. Gaggia Naviglio coffee machines have a pretty good reputation in Italy so there’s no wonder they’re popular on the international market. 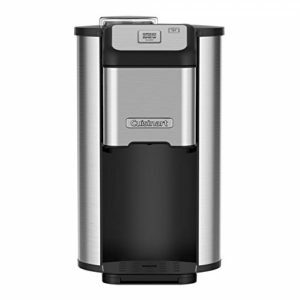 This coffee machine includes a boiler made from stainless steel, providing fast heating and coffee grinder with ceramic grinders, while the container may receive up to 300 g of coffee grains. 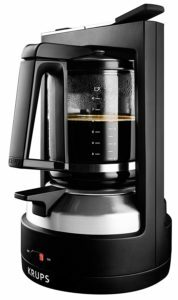 This American coffee maker comes with 100 paper filters and it also has a height adjustable drip tray which makes it a really practical solution for Americano coffee preparation. It has the capacity of 450 ml and both the grinding and the filter basket can be dismounted and easily cleaned in a dishwasher. In the end we have note that some very good coffee makers come from China or parts of some coffee makers brands produce in China. Previous story Should You Freeze Ground Coffee? Which good coffee makers NOT made in China do you recommend? How To Clean A Coffee Maker Without Vinegar?